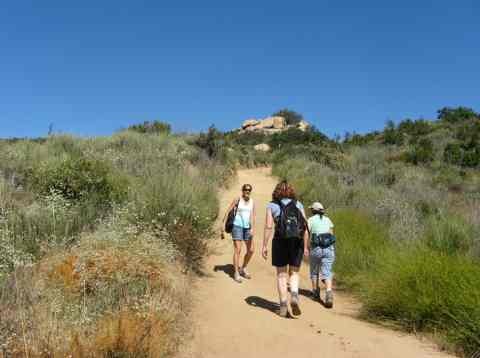 Try these hiking trails in San Diego county. 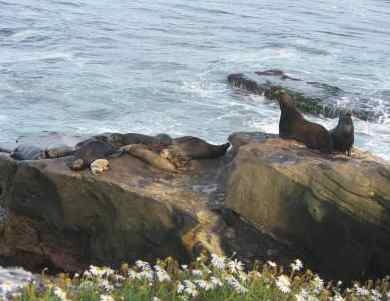 These popular day hikes allow you to experience the joy of hiking in San Diego. 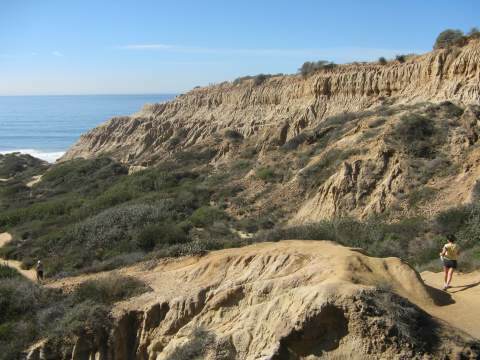 Torrey Pines Reserve and Beach, just north of La Jolla in San Diego CA, offers several nice hiking trails with view of the ocean, and one option to hike back along the beach trail. Beach Trail - The Beach trailhead leaves from the restroom at the top of the hill, and goes 3/4 miles to the beach, where a steep staircase descends to the beach near Flat Rock. At low tide (3 feet or less) you can walk north along the beach 3/4 mile to the lower parking lot. (If the tide is low enough to get around Flat Rock, you can walk south another mile or so and you will eventually arrive at the unofficial clothing optional Blacks Beach. We like to park at the bottom so the hike starts with a 300 foot elevation gain to the trail head, otherwise you need to hike back up at the end, for a total hike around 2 miles. Guy Fleming, Parry Grove, Razor Point Hiking Trails - These trails near the top range from 0.5 miles to 1.5 miles and offer diverse scenery and some dramatic views of gorges and ocean views. Hike the Elfin Forest Way Up Trail, one of the best hiking trails in San Diego area. 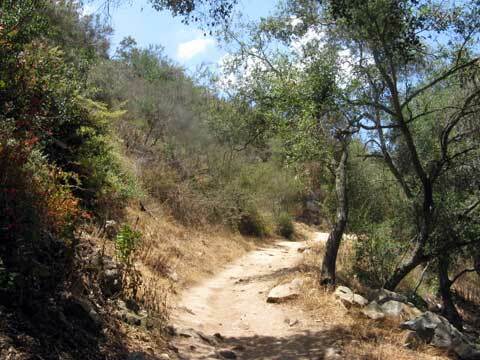 Located northeast of San Diego in Escondido, this offers some of the best elevation gain for hiking in the area. Daley Ranch, a 3,000 acre conservation area, is located in Escondido, Cal, just northeast of San Diego. 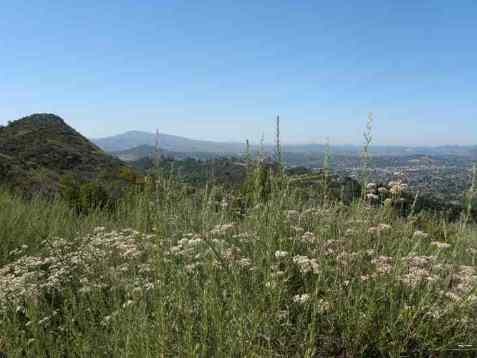 It offers some spectacular hiking and spring wildflowers, and a grassy picnic area nearby at Dixon Lake. San Diego Balboa Park in the heart of San Diego offers spectacular hiking in San Diego. There are many trails around the park that are surrounded by trees, making you forget that you are in the middle of a large city. If you choose, you can also walk through areas with the historic buildings and see some of the splendid architecture too. 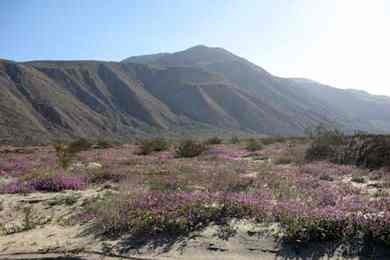 Anza Borrego Desert State Park is a 90 minute drive northeast of San Diego Cal. It is usually 20 degrees warmer than the coast, making it a great place for a day trip fall, winter or spring. 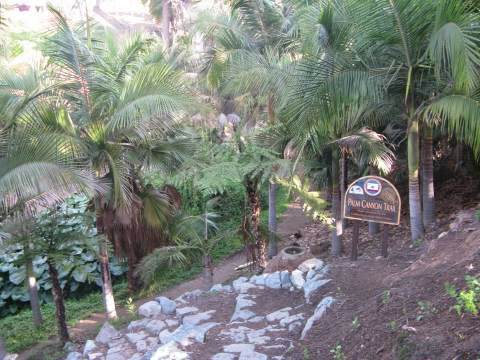 One of the best San Diego hiking trails is the Palm Canyon Trail, an easy three mile round trip walk to a native palm oasis. There are also great wildflower blooms in the spring. Directions to trailhead: The trail begins at Borrego Palm Canyon Campground, located one mile north of the park headquarters, west of the town of Borrego Springs, CA. Trailhead parking is available at the west end of the campground near the campfire circle. There are many great places to walk along the beach in San Diego. 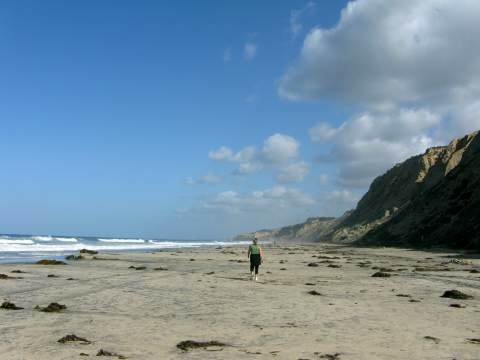 With 70 miles of beaches, that means 70 miles of hiking trails in San Diego beaches! It is best to go at moderate to low tides, 3 feet or less for most beaches (1 foot or less in Solana Beach), and you can quickly get away from the crowds and see some interesting views, scenery and beach homes. Some beaches have concrete boardwalks that stretch for several miles along popular beaches like Pacific Beach or Tamarack Beach in Carlsbad.